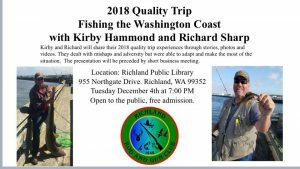 Kirby Hammond and Richard Sharp will make a presentation on their 2018 Quality Trip that took place along the west coast of Washington for the purpose of fishing and crabbing. Their main stops were Neah Bay, La Push and Westport. For almost thirty years, Country Music Hall of Fame members The Oak Ridge Boys have been a part of their fans’ holiday seasons with their annual Christmas tour. 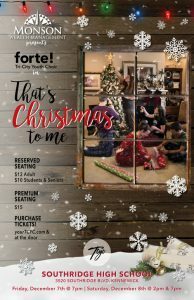 A mixture of traditional and contemporary songs – including religious, romantic and fun holiday tunes – makes up the set list, which includes songs from the Oaks’ seven bestselling Christmas CDs. A highlight of the evening is the much-loved “rocking chair” segment where each BOY rocks by the fireplace and shares personal thoughts about Christmas. 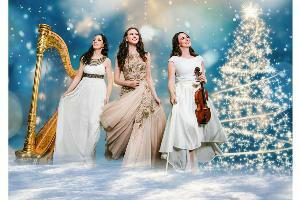 Affiniti, a classical crossover group from Ireland, returns to the Tri-Cities on their Pacific Northwest holiday tour. The trio will play a Celtic Christmas Concert, with special guest appearance by Howard Crosby, nephew of Bing Crosby. Affiniti’s style is a blend of classical, rock and Celtic music. 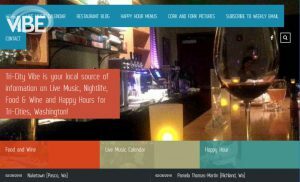 Crosby, a Walla Walla business owner, sings tunes from Bing’s era, including some of his most famous holiday songs. Proceeds benefit the non-profit Arts Center Task Force, sponsor of the Vista Arts Center building project. Friday from 6 p.m. – 9 p.m.
Saturday from 5 p.m. – 9 p.m. The annual holiday light show at Senske headquarters is a proud tradition. They put up more than 500,000 holiday lights in an animated display open to the public. Lights are synced with music creating a beautiful melody of dancing holiday lighting. Senske partners with 2nd Harvest to raise awareness and accept non-perishable food and cash donations for those in need. 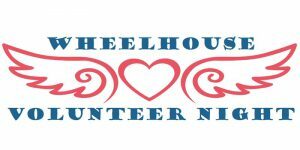 Dutch Bros. Coffee and Between the Buns will be on hand providing hot food and drinks with proceeds going to 2nd Harvest. Photos with Santa are available with every donation. 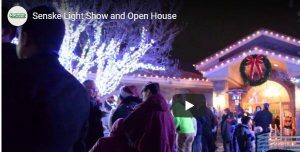 Note: the light show will run nightly during December following the open house. Tune your radio to 90.3 FM. Cost: $25 general admission / $20 students and seniors – tickets will be available at the door. 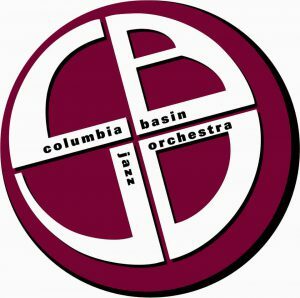 Hear the roaring sound of the Columbia Basin Jazz Orchestra, directed by Randy Hubbs. Brace yourself for a spectacular evening from one of the few professional big bands in the Northwest! Aside from great big band music, this year’s show will feature talented vocalists from our area singing variety of holiday selections accompanied by the jazz orchestra! Come celebrate with us this season as we highlight the things that make Christmas such a special time of year and bring joy and hope to each of our hearts. 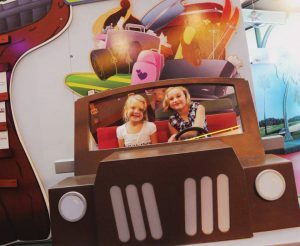 We promise laughter, entertainment and a heartwarming experience you won’t soon forget. The ACT production of “Elf” features a cast of 43 youth actors, ages 9 and older. 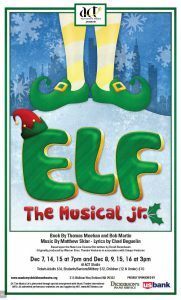 Directed by Josh Darby and produced by Lisa Howell, “Elf” is an engaging and hilarious musical with a heartfelt holiday message. The script closely follows the classic Disney movie, and it is considered one of the most memorable modern Christmas stories. The plot revolves around Buddy, a human reared as a Santa’s Elf, who travels to New York City in search of his father. Future dates: December 14 & 15 at 7 p.m.; December 15 & 16 at 3 p.m.
Saturday at 1 p.m. & 7 p.m. 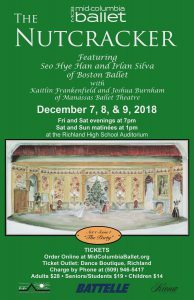 This year Mid-Columbia Ballet’s annual full-length production of “The Nutcracker” will feature guest artists, Seo Hye Han and Irlan Silva of Boston Ballet performing the roles of Sugar Plum Fairy and Cavalier. We will also have guest artists and MCB alumnus, Joshua Burnham and his partner Kaitlin Frankenfield from Manassas Ballet Theatre. Tickets can be purchased online, in person at the Dance Boutique in Richland, or on the phone at (509) 946-5417. 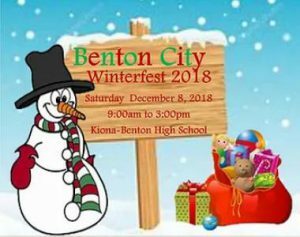 Our Annual Winterfest in Benton City, second Saturday in December, contains over 80+ vendors located in our High School facilities. Along with music, food, a Kid Zone, and the ever famous Santa Claus! Start off in the morning with our Santa 5k and 1 mile Reindeer Trot at 9 a.m.
Then hoof it on down to High School for refreshments and Shopping!! 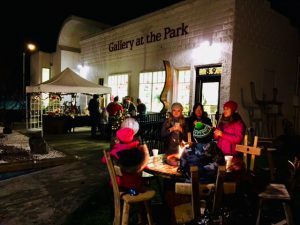 Then wrap up the family in their coats and hats and head downtown for the Lighted Parade at 5 p.m. Wrapping it up in the park for City Tree Lighting at 6 p.m. along with cocoa and cookies. 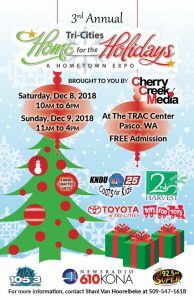 Come celebrate the Christmas Season in Historic Downtown Kennewick – have your picture taken with Santa, listen to the special readings of The Polar Express, enjoy hayrides, visit Santa’s Workshop, play games, drink apple cider, etc! This event will be held again on December 15. 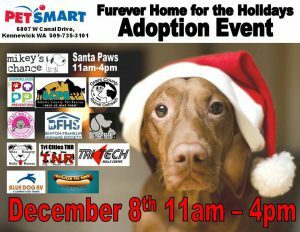 Several animal rescue organizations will be on hand with over 80 adoptable pets that are looking for furever homes. 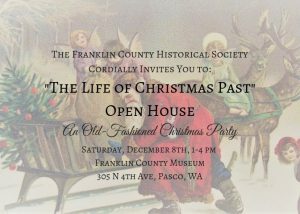 The Franklin County Historical Society cordially invites you to “The Life of Christmas Past” Open House – an old-fashioned Christmas party. Join us for cookies, hot chocolate, caroling, a visit from Father Christmas, and more! Followed by a luminaria in memory of our loved ones who have passed. Two performances: 3 p.m. and 7 p.m.
You are invited to join Bells of the Desert as we celebrate our 10th season. 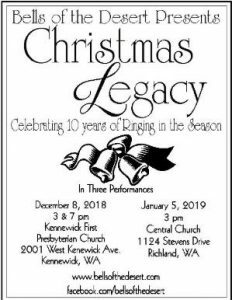 Join us on December 8, 2018 at Kennewick First Presbyterian Church for the first concert of our 2018-19 season, commemorating 10 years of ringing, and looking forward to many more. We will perform a matinee concert at 3:00 p.m. and an evening concert at 7:00 p.m. We will also be performing again on January 5. 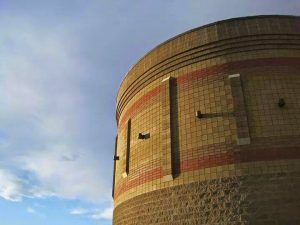 From 5 p.m. – 7:00 p.m. Put on your ugly Christmas sweater and join us for our annual Christmas celebration! 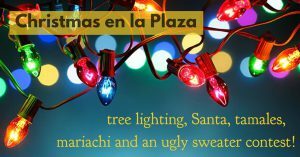 Join us for festive fun including entertainment, food, community leaders and the tree lighting! Join the Tri-City Americans as they compete against the Lethbridge Hurricanes. Saturday from 10 a.m. – 6 p.m.
Sunday from 11 a.m. – 4 p.m. The annual Home for the Holidays is a 2-day expo with dozens of local and regional retail vendors under one roof and features various performances by local musical and dance groups, retail shopping and much, much more! 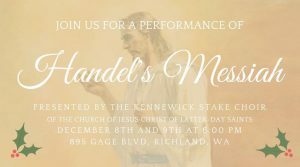 The Kennewick Stake Choir of the Church of Jesus Christ of Latter Day Saints will perform a one-hour version of Handel’s Messiah directed by Paris Rodgers with choir, orchestra, and soloists including James Mohlman, baritone soloist. All are welcome to attend. 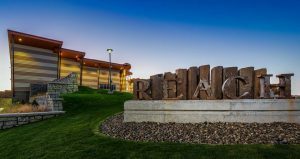 Enjoy Winter Wonderland activities at John Dam Plaza the first three weekends in December as well as activities at the Richland Community Center all month long. 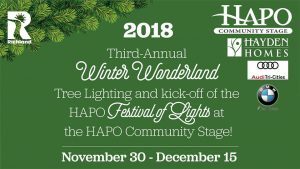 In addition, the HAPO Festival of Lights will be on for all to enjoy every night until January 2nd from 5:30 p.m. – 10:00 p.m. each evening. 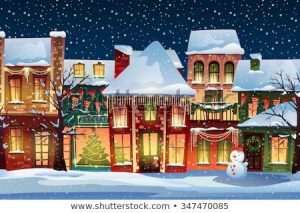 – December 7: Secrets of the Sun at 7 p.m. and Stars of the Pharaohs at 8 p.m.
– December 8: My House Has Stars at 2 p.m. and The Little Star That Could at 3 p.m.